This book is a revealing and thoroughly enjoyable journey through the intricate history of English Freemasonry. Historian Dr David Harrison reconstructs the hidden history of the movement, tracing its roots through a mixture of medieval guild societies, magic, alchemy and necromancy. He examines the earliest known Freemasons and their obsessions with Solomon’s Temple, alchemy and prophecy to the formation of the Grand Lodge in London, which in turn led to rebellions within the Craft throughout England, especially in York and with the formation of the antients. Harrison also analyses the role of French immigrant Dr Jean Theophilus Desaguliers in the development of English Freemasonry, focusing on his involvement with the formation of the mysterious modern Masonic ritual. All Freemasons and more general readers will find much of interest in this fascinating exploration of the very beginnings of Freemasonry, still one of the most mysterious brotherhoods in the world. The book has received excellent reviews and is available at all book outlets. There will be a new updated paperback edition of my first book The Genesis of Freemasonry coming out soon. It is to be published by Lewis Masonic. More details to follow…. 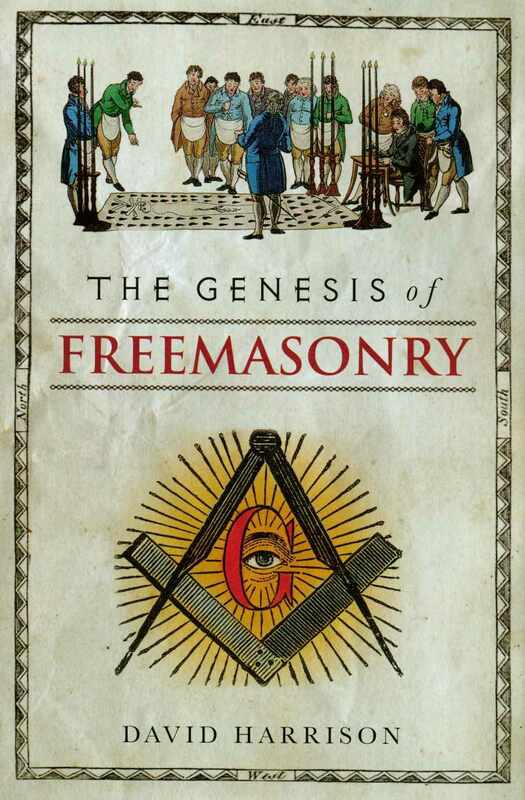 This is a fantastic informative book, charting the origins of Freemasonry from its dark mysterious past of magic and alchemy, up to the foundation of the Grand Lodges in the eighteenth century. The book also mentions famous Freemasons such as Natural Philosophers like Christopher Wren and Jean Desaguliers, poets like Alexander Pope and Jonathan Swift, and many more. This book reveals the true beginnings of a much misunderstood society. I highly recommend this book, full of facts, nicely done . I give it a 5 star! This stellar book is a well written documented history of the beginnings of Freemasonry during the late seventeenth century and throughout eighteenth century England. The author Historian Dr. David Harrison takes you on a fascinating journey through all the little nuances of the Craft. Exploring the roots of Freemasonry and all it’s degrees, the lodges, Grand Lodges, and the men who became Freemasons. The book mentions men like Benjamin Franklin, Christopher Wren, Elas Ashmole, Oliver Cromwell, Jean Desaguliers, Alexander Pope and many more. It explores the rituals, the architecture of Freemasonry, the politics of Freemasonry, the rebellion within Freemasonry, the reconciliation and the coming together under the United Grand Lodge of England. It Shows how the Craft evolved and how it used elements of architecture, science, mathematics, poetry, art, magic, alchemy and astronomy as it’s foundation. The author discusses the three transitions of English Freemasonry and the cultural impact of the Craft. Most will find this book very informative on a subject which has long been filled with secrecy. Packed with facts and fascinating photos this book is a serious look into the world of Freemasonry. I highly recommend it. 5 stars all around! Nice one to add to your book library. English historian David Harrison, PhD, explores the origins of Freemasonry in a scholarly but very readable book The Genesis of Freemasonry (Lewis Masonic, an imprint of Ian Allan Publishing Ltd., Hersham, Surrey, England, 244 pages, $31.95, available on Amazon.com and other online booksellers). Harrison sent me a review copy of his book after reading my reviews of books on Freemasonry. He suggested that it would be useful to understand the intellectual underpinnings of Freemasonry via a scholarly book like his. Masonry has been described as a “society of secrets” as well as a “secret society.” Historian Harrison is a lecturer in history at the University of Liverpool, where he earned his doctorate. He reconstructs the hidden history of the movement, tracing its roots through a mixture of medieval guild societies, alchemy and necromancy. He examines the earliest known Freemasons and their obsessions with Solomon’s Temple, alchemy, and prophecy, to the formation of the Grand Lodge in London in 1717, which in turn led to rebellions within the Craft throughout England. Harrison also analyzes the role of French immigrant, Dr Jean Theophilus Desaguliers, a Protestant refugee from Roman Catholic persecution, in the development of English Freemasonry, focusing on his involvement with the formation of the mysterious modern Masonic ritual. All Freemasons and more general readers will find much of interest in this fascinating exploration of the very beginnings of Freemasonry, still one of the most mysterious brotherhoods in the world, he says. Freemasonry had its origins in the guilds of “operative” masons — actual stoneworkers — who attracted the attention of “speculative” masons, mostly gentlemen and members of mercantile and aristocratic classes in the United Kingdom. It soon became fashionable for intellectuals and scientists and architects to become masons, where, Harrison says they could leave their religious and political differences at the door to the lodge, often a tavern or pub. It afforded like-minded men of all classes in the heavily class conscious UK to get together and eat and drink — lots of drink — Harrison says, and discuss intellectual and philosophic and scientific ideas. I was startled, to say the least, to find in Harrison’s books descriptions of licentious clubs called Hell Fire Clubs, organized by prominent Freemasons, where the men dressed like monks and the invited women, including local talent, dressed like nuns, engaging in orgiastic ceremonies.